There is really no need to introduce this meal. It was another “hmm…what can I make” with a splash of “damn, weigh in is soon and that weekend away did not help the Weight Watchers cause.” There is one big thing that I will do different in the future – reduce the Sriracha. The spiciness was good for B but it was really overwhelming for me. I would recommend bringing it down to 1/2 – 1 tbsp instead. Additionally, when I seared the tuna it got slightly burned because of the sugars in the marinade. In the future I might sear slightly and then bake it in the oven to cook it the rest of the way through. Add tuna steaks, soy sauce, Sriracha sauce, and 1 tsp of sesame oil into a large plastic bag. Shake well to make sure the tuna is well coated. Place in refrigerator until ready to cook. 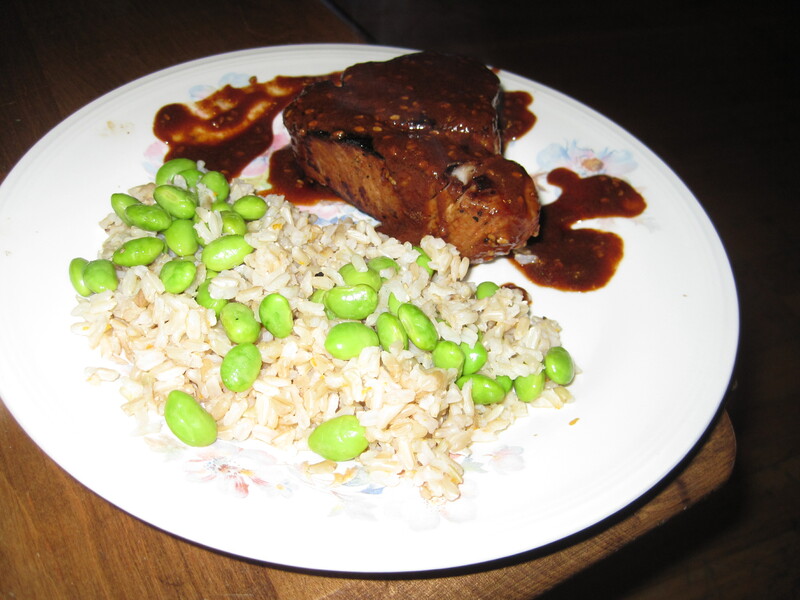 In a bowl, add rice, edamame (out of pod), 1/2 tsp sesame oil, and sea salt. Mix well. Add rice to the edamame. If necessary, reheat slightly in the microwave for 1 minute. In a hot pan or griddle, sear tuna. Cook for approximately 4-5 minutes on each side. In a small pot, add the remainder of the marinade and reduce the sauce. Serve sauce over the cooked tuna.